A Goal is the desired result one wants to achieve. Achieving your goal is a form of success that everyone desires. However, merely dreaming or talking about a goal will never get you there. It is, therefore, important to realize that goal setting has to be structured depending on many factors. Goal setting can apply to all areas of your life, and therefore every factor that plays a role in your goal setting must be considered. Set goals the “SMART” way to personal success. 1. Specific – Your goals have to be very specific. Do not generalize. For example, instead of saying you want to be a Doctor, you can be more specific like saying that you would like to be an Eye specialist or a Diabetologist or Children Specialist. 2. Measurable – It means that you should be able to measure your progress at each step. Unless you are able to measure your progress, you will not be able to monitor the time required for your desired results. Have charts or notes that indicate your progress. Measure each step as it progresses to ensure direction. 3. Attainable – No doubt your targets or goals should be of an attainable nature. It is easy to dream big and hopes for quick results. However, if you have even the slightest doubt about achieving it, you will be setting the wrong goals. You cannot afford to think wild and take chances, hoping that you will reach there. 4. Relevant – Are you studying economics and setting a goal to become a surgeon? Or you watch athletics the whole day to become a football player. Do you see the point here? If your goal is to represent your country in football, set your goal to be a footballer in a particular time from now. If you are doing your science degree, your goal of becoming a surgeon is more relevant. 5. Time Bound – This is your deadline. This is the most important focus area to attaining your goal. That is why, it is said, that your goal should be measurable. Having a time bound program will ensure that you stick to a schedule and ensure that no other deviation or distraction will divert the path to your goals. 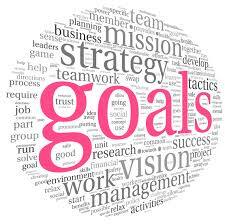 Another important aspect to keep in mind is to divide your goals into sub-goals. This is of prime importance since it would be easier for you to work yourself into achieving each sub-goal thus leading you up to your final goal. When you work on your sub-goals you will be able to take corrective steps in case you tend to falter or move the wrong path. It should be borne in mind that setting a goal and achieving it needs effort and patience in addition to being positive. You are bound to face difficulties, criticism, alienation, defeats, and discomfort. With every fall you have to rise, focusing on your goal. Once you succeed at each sub-goal, believe me, the happiness and confidence you develop will guide you through to the pinnacle of success. Visualize the footballer who dribbles, kicks, push, falls, then gets up again to get that ball and shoot it into the goal. The celebration is seen in the excitement that follows in the manner he runs on the ground throwing off his shirt and throwing his arms out at the applauding spectators. You can do the same. So, get set, go… Wish you all the best! How To Attract Health, Wealth, Happiness & Success!